You’ve gone through the painstaking work of setting up your Google Analytics account, installing Google Analytics in your shopping cart, configuring exclusion settings and the like. Next up, you test a transaction from search engine through order process and checkout, see the transaction show up, and are feeling pretty good. You look through the data and the navigation you just did while testing and it makes sense. So far, so good. Rinse, repeat for one or two more. OK, you wait for the new orders from a new day with fresh orders place by other people forging their own path through your site and are looking forward to a bit of fresh Sherlock tracking work on new, unfamiliar evidence. Wait, you have 20 new orders that a definitely real, since you see the actual credit card transactions and the money is on its way. But Google Analytics insists that you’ve only done 15 transactions on the day. What gives? Were these ghost orders? Well, there’s money in my account, so that’s my kind of ghost. There are actually quite a few suspects as to who’s responsible for these ninja orders that sneak in, buy product and pay for it, but are in and gone without GA noticing them. Let’s start with Ad Blockers. 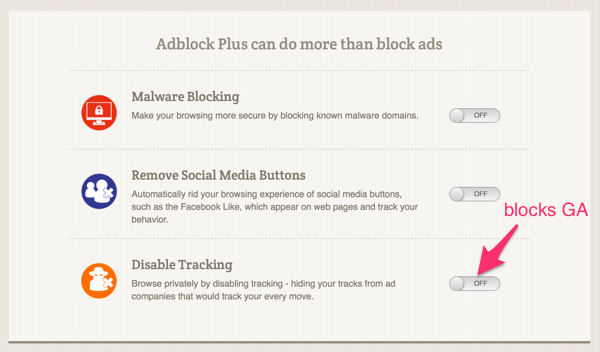 Most popular ad blockers can block Google Analytics tracking, either by default or an easy toggle on installation. If properly installed, your visitor is blocking ads, you usually do not know much about these visitors. Usually really nothing, not even the fact that this user visited your website/cart. Additionally, there are in-browser features not requiring any install (e.g., Firefox Private Browsing/Tracking Protection) which will block GA.
Is GA allowed by default? Is GA easily blocked on install? How do you beat an Ad Blocker for GA? A VERY broad description of the proxy approach. Then change the target host from google-analytics.comto your own domain name using find-replace. Create a proxyendpoint to Google Analytics servers on your back end. Next Lesson: “Server Side” Solution. Stay tuned!